When my son was in early elementary school, he asked us if he could join Cub Scouts. It was a no-brainer for us, and in that moment we became a Scouting family. Fast forward several years, through Cubs, and into Boy Scouts. By this time, I had helped organize several campouts, day hikes, and backpacking trips; frankly, I was getting a bit jealous. I started leading trips myself. But the question in the back of my mind was, “what about the girls?” Long story short, in 2010 we formed a Venturing Crew, and my friend Jennifer and I signed up as advisors. Venturing is an arm of the BSA. It’s designed for older teens, and is coed. Our crew was always predominately girls, and our focus was on hiking, backpacking, and going to Philmont Scout Ranch in northern New Mexico for two eleven-day backpacking trips in the Sangre de Cristos. 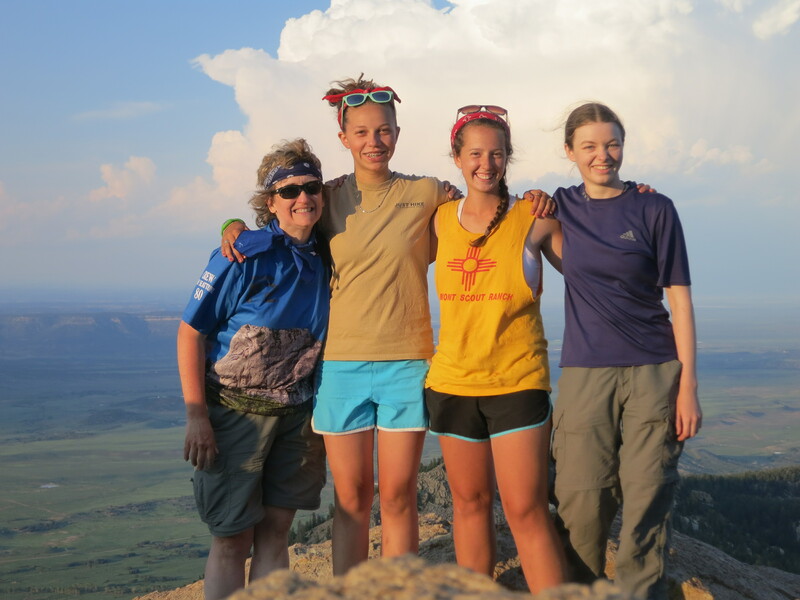 Prior to our time at Philmont, none of the girls had much experience on the trail. We worked with the entire crew on basic backpacking skills: cooking, first aid, navigation, you name it. When we got to Philmont for our 2011 trek, our Ranger was impressed with how much our crew already knew. Even with all the skills in place, several of the crew members didn’t have a lot of miles under their boots. But they persevered, through heat, challenging weather and rough terrain. We were given the opportunity to return to Philmont two years later. By now, our girls were experienced backpackers, and one of them, Julieanne, was chosen to be the crew leader for the trip. The crew leader is in charge of everything, from navigation to conflict resolution. The adult advisors are there to backstop the crew leader, but only as a last resort. Julieanne and Anna were veterans of our 2011 trek, and their experience was invaluable in 2013. For the advisors, it was great to be able to rely on them. I love seeing women adopt the backcountry as their own. For Julieanne and Anna, they earned the moniker Mighty Hiker Women of Philmont. I’d happily go hiking with them any day.